The House of Châtillon was a notable French family, with origins in the 9th century and surviving until 1762. 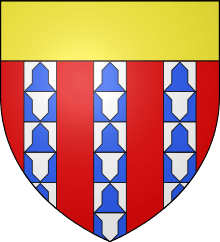 The name comes from a county in Champagne, with its capital in Châtillon-sur-Marne and branches in Saint-Pol-sur-Ternoise, Blois, Penthièvre (title later seized by and reverted to the Dukes of Brittany at various times), Chartres, etc. The Châtillon-sur-Marne branch melt since 1659 with the Wolbock family. Charles of Blois Châtillon (1319–1364), was canonized as saint, ruled over the Champagne branch. His claim to be Duke of Brittany, jure uxoris ignited the Breton War of Succession. His title would pass for a time to his descendants. Raynald of Châtillon (c.1125–1187), took part in the Second Crusade, controlled Antioch and was captured and executed by Saladin after the Battle of Hattin. Walter III of Châtillon (1166–1219), Sénéchal of Burgundy, escorted Philip II of France to the Holy Land and distinguished himself at the siege of Acre and the battle of Bouvines. Gaucher V of Châtillon (1249–1329) great-grandson of the former, constable of France under Philip IV of France and minister of Louis X of France. This house is totally distinct from the house of Châtillon-sur-Loing, which produced (among others) the Coligny brothers : Gaspard, François and cardinal Odet. Chisholm, Hugh, ed. (1911). "Châtillon". Encyclopædia Britannica. 6 (11th ed.). Cambridge University Press. p. 7.